With spring break coming up, I figure lots of folks will be heading out to go hiking with their kids. 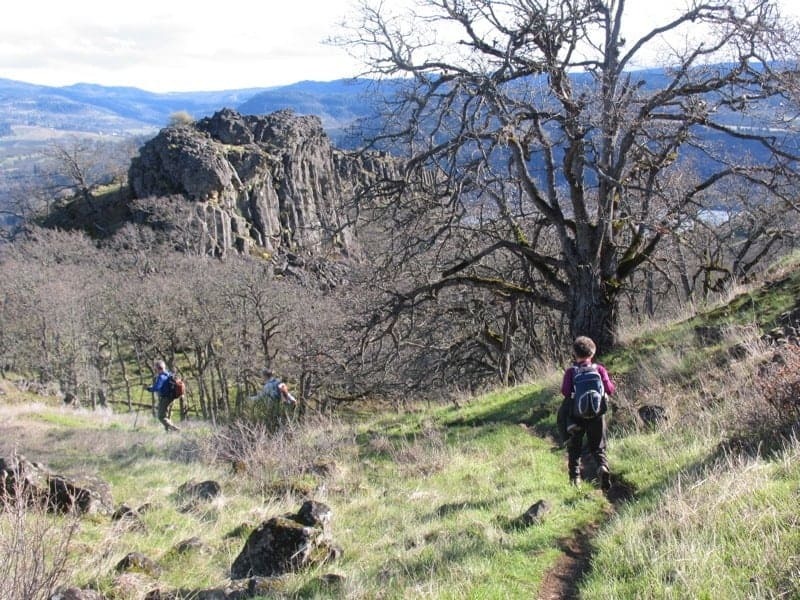 And even if we have a normal winter, by that time the Columbia River Gorge is usually snow-free in the lower elevations, making for great spring hiking. Of course, 2015 is turning into “the winter that wasn’t,” so we don’t even have to wait for March to take the little ones out for a walk. In fact, reports are that the wildflowers are weeks ahead of schedule, so get on out there for some family fun on the trails! First, a disclaimer: I am thinking here about kids who can walk as much as 2 or 3 miles, and I’m making special comments on things to look out for. Done right, these hikes are all safe, easy to get to, and, importantly, they aren’t loops, meaning they are easy to get out of if your young’uns get exhausted. 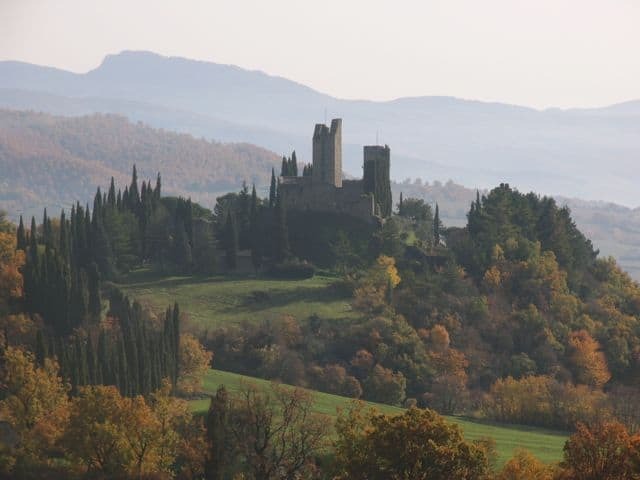 We’re starting out east and working our way back, to follow the spring bloom. 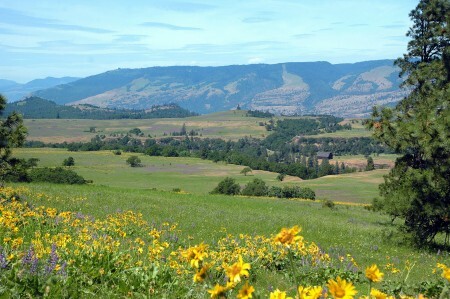 Start: At Rowena Crest Viewpoint, along the Historic Columbia River Highway about 6 miles east of Mosier. Distance: 2 miles. Elevation Gain: About 200’. Special Considerations: Ticks and poison oak, plus one place you should avoid due to cliffs. There are actually two hikes here. One is a two-mile meander among the wildflowers with awesome views of the Columbia River, and even a couple of ponds where you can look for birds and listen for frogs. From now through April this should be an amazing show of flowers, for very little effort. The cliffs are off to the right of the first pond. The other hike is a three-mile roundtrip to a great view of Hood and Adams from McCall Point. But that trail gains about 1,000 feet. The first part of this should be no problem for kids, but when the switchbacks start, you might head back. Crossing Catherine Creek on a fun, bouncy bridge. Start: At Catherine Creek Trailhead, about 8 miles east of the Hood River Bridge on Old Highway 8 in Washington. Distance: Up to 2.5 miles. Elevation Gain: Maybe 700’. Special Considerations: Ticks and poison oak, plus massive weekend crowds. 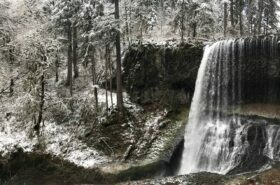 Featured in my book, 60 Hikes Within 60 Miles of Portland. There are actually three hikes here, all of them pleasant rambles through flower-filled meadows while being serenaded by meadowlarks. From the trailhead, while looking up and away from the river, head left for a 2.5-mile loop that crosses a couple of small creeks and winds up at a view of Rowland Lake. When it starts up the ridge, and after a mile from the car, you get to a viewpoint with an amazing old snag of a tree. Hike #2 is heading right and uphill from the trailhead, a 2-mile loop through more meadows and along the creek, eventually to the top of a cool rock arch. You’ll also pass the remains of an old corral. 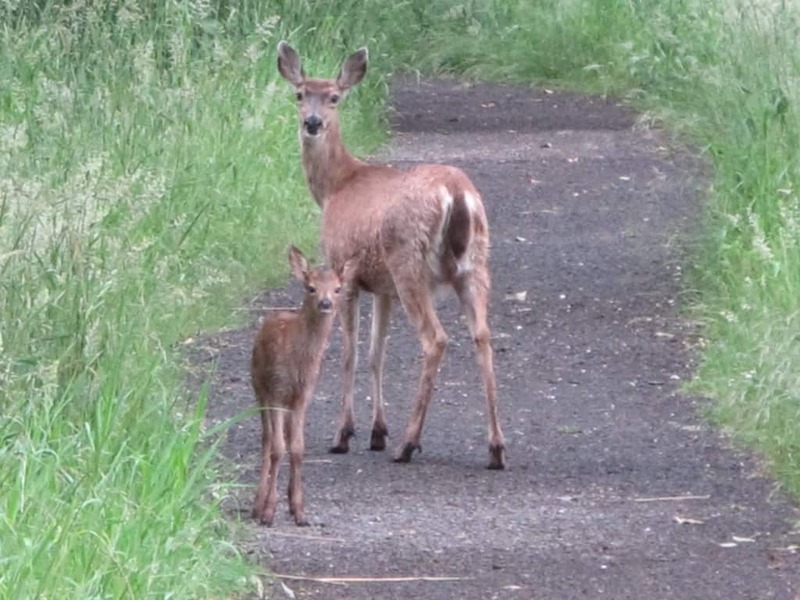 Option #3 is a paved, 1.2-mile all-access trail below the trailhead which is perfect for really little kids or strollers. Lots of cool places to wander around in The Labyrinth! Start: About 5 miles east of the Hood River Bridge, at the intersection of WA 14 and Old Highway 8. Distance: 2 miles. Elevation Gain: Maybe 570’. Special Considerations: Ticks and poison oak. More from oregonhikers.org; a similar, tougher nearby hike is in my book, 60 Hikes Within 60 Miles of Portland. The Labyrinth, just west of Catherine Creek, is a fantastic area of rock formations, pocket meadows, waterfalls, a cave, wildflowers, and creeks — perfect for exploring, in other words. And now, with actual signed trails, getting lost is optional — but highly recommended. Walk up the old highway headed west and look for trails heading uphill. Or just wander around. Great times! One of many waterfalls along the Eagle Creek Trail. 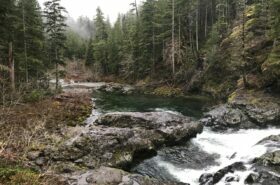 Update: As of January 2018, this trail is closed because of the 2017 Eagle Creek Fire. Check the National Forest website for the latest info. Start: Off Exit 41 from Interstate 84, right after Bonneville Dam. Distance: 4 miles. Elevation Gain: 300’. Special Considerations: A hard, rocky trail and some places along high ledges, with cables to hold onto. Also, you’ll need a NW Forest Pass. More from oregonhikers.org or my book, 60 Hikes Within 60 Miles of Portland. I hesitate a little to include this on a list of kids’ hikes, because of the ledges, but they aren’t in the first mile of trail. And the section of ledge on the way to Punchbowl Falls, which is totally worth seeing, has cables to hold onto. Otherwise, this is just a wonderland of canyon, trees, waterfalls, and easy trail. Start: Off Exit 40 from Interstate 84, the same for Bonneville Dam. Distance: 2 miles. Elevation Gain: 200’. 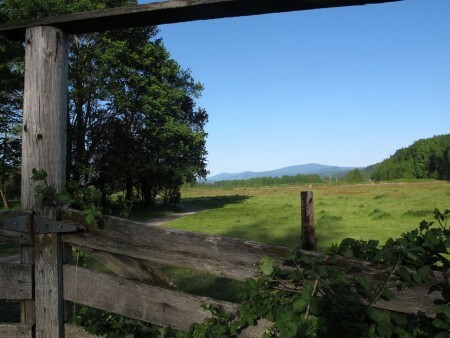 Special Considerations: Just that you’ll need a NW Forest Pass. More from oregonhikers.org or this blog post I did, with videos. This might be the best of the bunch, for kids: easy access, easy hike, no risks, beautiful waterfalls. What’s not to love? You’re right along the creek most of the time, and when you come to an unsigned junction, you can go either way, but I recommend the right. It avoids a small climb and sticks to the creek. Great payoff for not much effort here. Start: In Beacon Rock State Park. Distance: 2.2 miles. Elevation Gain: 700’. Special Considerations: You’ll need a Washington Discover Pass to park. Pool of the Winds: This is the first mile of a pretty good conditioning hike up Hamilton Mountain. There are a couple of steep sections in here, but they are brief, and the waterfall is worth it. At 0.9 miles there’s a side trail to look at the falls, then 100 yards later a trail drops down to cross Hardy Creek, before climbing up towards Hamilton. 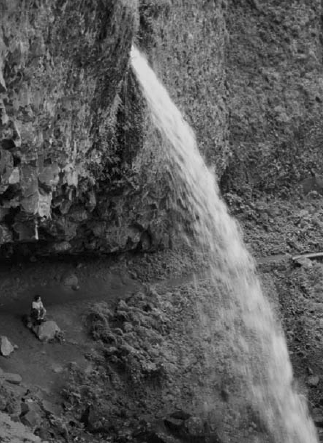 But be sure to go up from the junction, as well, to see Rodney Falls, aka Pool of the Winds, where water blasts out of a tiny nook in the rock wall. Beacon Rock: This one might make kids a little nervous, since it’s basically all scaffolding on the side of a cliff. But if they are up for an adventure, and not afraid of heights, it’s quite an experience. It’s 1.8 miles up, all switchbacks, with a nice view on top. 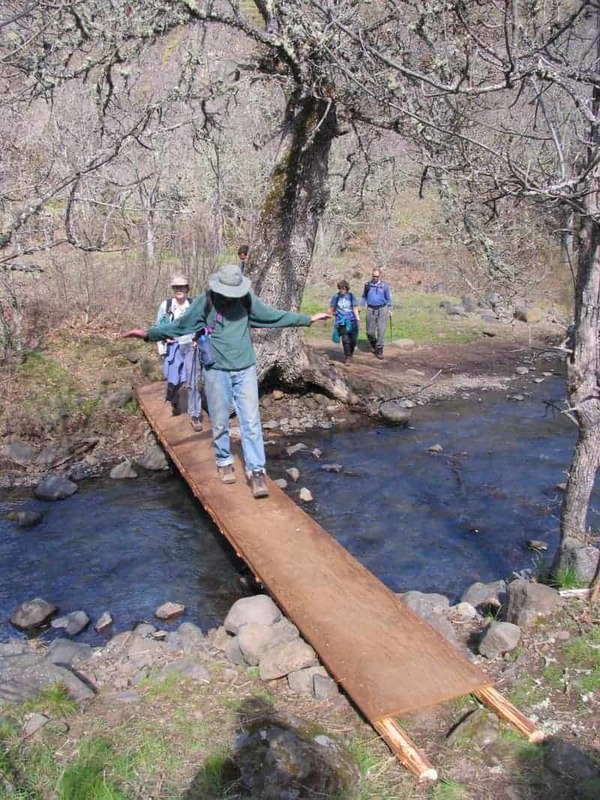 Here are more details from oregonhikers.org. Get your own copy of 60 Hikes Within 60 Miles today! Order it from my web store, and I’ll sign it however you want. Elowah Falls, By Steve Hart at oregonhikers.org. Start: At John B. Yeon Trailhead, 2.1 miles east on the frontage road from Exit 35 off Interstate 84. Distance: 1.4 miles. Elevation Gain: 280’. Special Considerations: Some clifftop trail, but with handrails. Nothing much to this one, except that it’s an easy hike to an amazing waterfall that not many people seem to know about. The ones who do, however, tend to be families with little kids. For all the people who know about hiking in the Gorge, this little trail seems downright undiscovered. 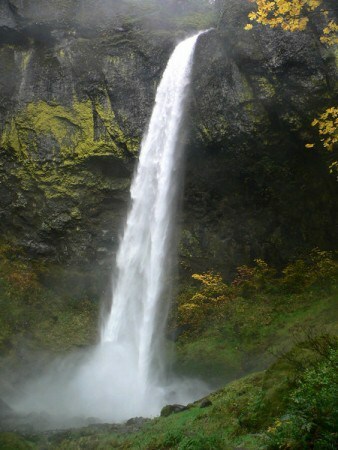 Start: At Horsetail Falls, just east of Multnomah Falls on the Historic Columbia River Highway. Distance: 0.8 miles, could be extended to 2.6. Elevation Gain: 280’. Special Considerations: Half a mile of highway-shoulder walking, if you extend. 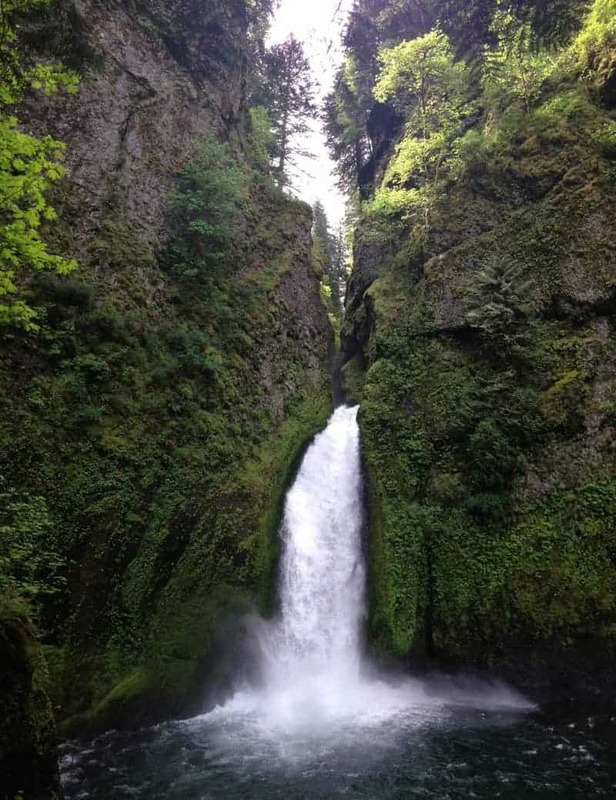 Featured in my book, 60 Hikes Within 60 Miles of Portland, as part of the Triple Falls Hike. For me, as a kids’ hike, this one is much better than its super-crowded neighbors, Multnomah Falls and Wahkeena Falls. You should do those, sure, but on this much more private walk, you can visit two great waterfalls, and even go behind one! That’s all in the 0.4 miles one-way to Ponytail Falls, up above Horsetail. 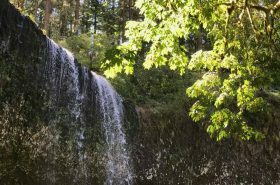 If you extend your walk to 2.6 miles, you’ll also visit a weeping wall, cross the top of Oneonta Gorge, and then drop back down to the highway, on which you walk to the right back to your car. 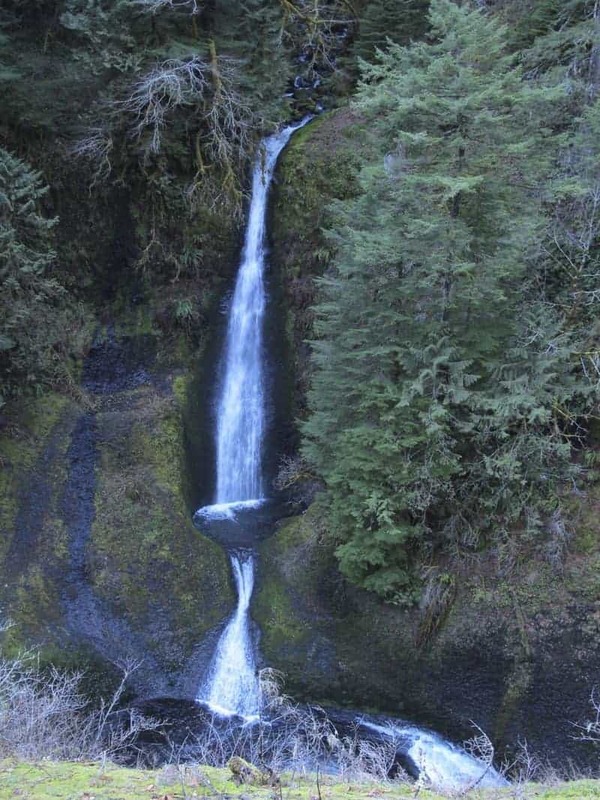 From the Oregon Hikers Field Guide, here’s Ponytail Falls and the longer loop, the Horsetail Falls Loop. Start: At the parking area off WA Highway 14, At Horsetail Falls, just east of Multnomah Falls on the Historic Columbia River Highway. Distance: 0.8 miles, could be extended to 2.6. Elevation Gain: 280’. Special Considerations: Half a mile of highway-shoulder walking, if you extend. More from this blog post I wrote. Also featured in my book, Peaceful Places in Portland. Steigerwald Lake NWR, which just opened barely four years ago, is known mostly as a birding paradise. It’s got a little, 1.2-mile trail across it, plus one other side trail, two lakes, and an old levee road on the far side. So it’s not much more than a leg-stretcher, and signs specifically prohibit jogging, bikes, horses, and dogs, even on leash. All in all, a lovely little leg stretcher, and a fine place to watch our flying friends. And, for that matter, our crawling friends. Start: At the parking area off Interstate 84 in Troutdale. Distance: Whatever you’d like. Elevation Gain: None. Special Considerations: Dogs, dogs, everywhere! 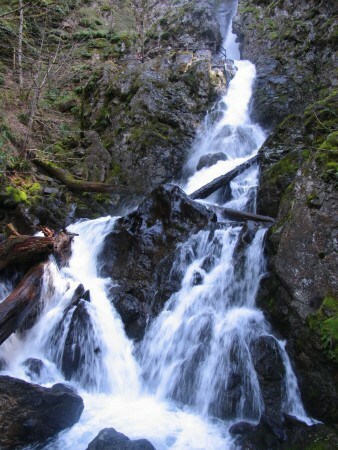 Info from Oregon State Parks. Featured in my book, Peaceful Places in Portland. This is doggie heaven: roads and trails crisscross 1,400 acres of woods, forest, creeks, and (in the winter and spring) ponds and mud puddles. And there are dogs, off-leash, everywhere. In fact, I felt out of place and weird for not having a dog out there. I won’t even bother telling you which trail to take, since they’re all just fine and just about the same, although it is worth it to make your way out to the Sandy itself. Once there, see if you can spot trees that have been gnawed on by beavers. Just understand that you won’t get there with dry feet (or at all) anytime between November and May. You can take me on some of these! I’m probably not any better than the kids. They’re all fun hikes! When are you coming?